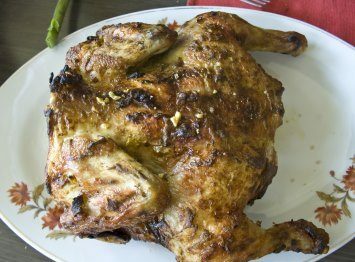 This “split” roast chicken recipe, formally called a spatchcock chicken, roasts faster than a traditionally roasted chicken. That’s because you remove the back bone, then break the breast bone to allow the whole bird to lie flat on the roasting pan. Detailed directions for how to do that are below. I think you will find it relatively easy. This is a fabulous way to make roasted chicken. The marinade makes the chicken so tasty and juicy. The only negative? It does spatter in the oven a bit so be ready for that. Turn the chicken over on to its breast side. Cut the chicken along both sides of the backbone with strong kitchen scissors. Remove the backbone and discard it. Rinse the chicken and pat it dry. Lay it flat on a cutting board, breast side up. With both hands, push on the breast bone to flatten the chicken as much is possible. Remove the wingtips. Choose your preferred rub (the herb rub is above and the garlic rub below) and mix it with the 1/4 cup of olive oil. Rub the mixture into the top of the skin as well as under the skin, then brush the top of the chicken with a bit more olive oil. Place the coated chicken in a shallow roasting pan, skin side up. Cover and set aside in the refrigerator for one hour for the flavors to meld. Take the chicken out of the refrigerator. Bake the chicken, uncovered, on the lowest rack of the oven for 45 to 55 minutes, until there is no pink near the bones. * Note that these directions are for a 2 1/2 pound chicken. Roasting time is slightly longer for a larger chicken. Here is the recipe for another rub you can use. It’s a lovely combination of garlic, herbs and spices. You will need a good knife or kitchen shears to cut out the backbone. I like to use kitchen scissors. I think it makes cutting the bones along the backbone much easier. I love this way to make roasted chicken. Let me know what you think when you try it. You can browse all of our chicken recipes here. This roast chicken would be great served with spicy potato wedges. Reset the oven temperature as soon as you remove the chicken from the oven and bake the potatos while the chicken is resting. Add a salad or another side vegetable and dig in! If you like this chicken recipe, please take a moment to Pin it to Pinterest, Tweet about it, Like it on Facebook and leave a comment below. Thanks a lot.